The video/graphics cards (also known as graphics accelerator cards) used in desktop PCs and laptop/notebook PCs contain the electronics that deliver the picture/display to the computer’s monitor or monitors. Monitors, because it has been possible to connect many monitors to a desktop PC via multiple graphics cards (called multi-monitor, multi-display, dual-display, etc.) since 1987 using the Apple Mac OS operating system (on the first colour Macintosh II) and since 1998 in Windows with the introduction of Windows 98. The computer’s graphics display can now be provided by a dedicated graphics card or by a graphics chip integrated on the motherboard or on the processor itself. There are two graphics standards used to connect graphics cards to a computer via adapter slots on its motherboard – PCI/PCI-X and PCI Express. The interface (connection) ports that these two standards use are VGA, DVI, DisplayPort and HDMI. The following diagram shows the PCI Express x16 and x1 slots and the two short standard PCI slots on a Gigabyte GA-MA78GM-S2H motherboard. Don’t confuse PCI-X (or PCIx) with the PCI Express (PCI-E) standard, because it stands for PCI Extended, which is a much improved extension of the PCI standard that is fully backwards compatible with the previous versions of the PCI 2.x standard. As with previous upgrades to the initial PCI-E specification, PCI Express 3.0 is backwards-compatible with earlier versions of the standard. Reviews of the performance of PCI-E 3.0 graphics cards makes it plain that the increase in performance from version 2.0 to version 3.0 is nowhere near the increase in performance between version 1.0 and version 2.0. 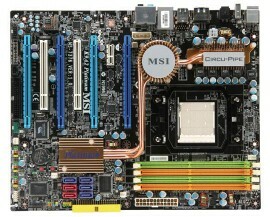 The image below is of the MSI K9A2 Platinum (AMD Socket AM2+) motherboard, which has four dark and light blue PCI Express x16 slots for four graphics cards, two white old-technology PCI-X slots and one PCI Express x1 slot used for sound cards, USB 3.0 cards, network interface cards, etc. When the appropriate slot cover (blanking plate) is removed from the back of the PC’s case by unscrewing the screw that keeps it in place, a graphics card is inserted in the selected slot and screwed to the case using the same blanking-plate screw so that its ports panel containing its connectors appears at the back of the case. There are other flowcharts covering the motherboard, disk drives, etc. and laptop repairs.